Gordon Meredith Lightfoot is a Canadian singer-songwriter who achieved international success in folk, folk-rock, and country music, and has been credited for helping define the folk-pop sound of the 1960s and 1970s. He has been referred to as Canada's greatest songwriter and internationally as a folk-rock legend. An eloquent composer, Gordon Lightfoot pens contemporary ballads that could easily be the envy of historic bards entrusted to record the world around them in all its beauty, harshness, and poignancy. Said Jack Batten, in the Toronto Globe and Mail, Lightfoot fills the role of "journalist, poet, historian, humorist, short-story teller, and folksy recollector of bygone days." From love songs to depictions of Canadian history and wilderness, Lightfoot's songs, many of which became virtual overnight standards ("If You Could Read My Mind," "Sundown," "Carefree Highway"), touch the listener on more levels and in more ways than most musicians could ever dream of. Born in Orillia, Ontario, on November 17, 1938, Lightfoot displayed vocal ability early on, noticed by his mother, who encouraged him to sing before women's clubs and at Kiwanis festivals. Later he studied classical piano, performed in plays, operettas, and barbershop quartets, played drums and sang in a dance band, and, finally, taught himself the basics of folk guitar. At Westlake College in Los Angeles he studied orchestration, earning his living doing vocal arrangements, demo records, and commercial jingles. In 1960 his attention was captured by the growing folk movement. Encouraged by Canadian friend Ian Tyson (of Ian and Sylvia), Lightfoot pursued the guitar seriously. He wound up performing in coffee houses in eastern Canada, where his distinctive voice and compositions were first noticed by the public. A number of Lightfoot's original works were covered throughout the 1960s by folk and country musicians including Peter, Paul and Mary, Judy Collins, and Johnny Cash, and he garnered a series of hit singles himself: "Remember Me," "I'm Not Saying," and "Black Day in July." Before success, though, he worked on a number of musical assignments including a stint on the Canadian television show "Country Hoedown." Of his experience he said in Canadian Composer, "I'm not particularly proud ... but it sure taught me a lot of things. I don't envy the kids who make it overnight.... There's no security in this business, but experience and training sure helps." Lightfoot had written some seventy-five songs, most of which "didn't really mean anything," before he heard wordsmith Bob Dylan for the first time and had his viewpoint about composing changed dramatically. His work became more personal, reflecting his own identity. When he made his New York City debut in 1965, the New York Times praised his "rich, warm voice" and "dexterous guitar technique." Continued reporter Robert Shelton, "With a little more attention to stage personality, he should become quite popular." The following year, United Artists released Lightfoot's first album, Lightfoot, and he was named Canada's top folksinger. In 1967 he moved into the position of top male vocalist, and in 1970 he was awarded Canada's Medal of Service, celebrating his positive general contribution to the good of Canada. After four more respectably selling albums, Lightfoot signed with Warner to record a number of albums on their Reprise label, including If You Could Read My Mind (originally released as Sit Down Young Stranger, which featured both title tracks as well as the melodic "Approaching Lavender"), Old Dan's Records, and Endless Wire. Several collections of Lightfoot's songs, including music and lyrics, were published by Warner Bros. Publications. By 1976 Lightfoot had earned eight gold albums and one platinum album--for Sundown, the title track of which brought him considerable popularity in the United States. The album sold over 1,500,000 copies during its first year of release (1974), replacing If You Could Read My Mind as a favorite of fans and critics and eventually holding a place on both the rock and country music charts. One of his best-known songs, the haunting ballad "The Wreck of the Edmund Fitzgerald," in which Lightfoot sings of the fate of the ship and crew of an ore carrier sunk on Lake Superior in 1975, appeared on his 1976 release, Summertime Dream. Despite having written over four hundred songs--a number of which received regular airplay--and having a number of best-selling albums and several Grammy Award nominations, Lightfoot did not score another Top 40 hit. In 1987, after a three-year hiatus from the recording industry, he returned with East of Midnight, the slickly produced pop ballad "Anything For Love," and a new stage show featuring more folk music. Contemplating retiring, Lightfoot told Maclean's, "When your albums aren't selling, it's not practical for a man to spend his life chained to a desk and to a recording studio. You have to grow up and realize that there is a new generation of recording artists out there." New artists can, however, cause problems. In April of 1987, Lightfoot filed a lawsuit against Michael Masser, alleging that Masser's song "The Greatest Love of All" (recorded by Whitney Houston) stole twenty-four bars from Lightfoot's 1969 hit "If You Could Read My Mind." According to Maclean's, Lightfoot commented, "It really rubbed me the wrong way. I don't want the present-day generation to think that I stole my song from him." Unlikely, though Lightfoot himself has always remained cautious and questioning about the industry. Said Toronto promoter Bernie Fiedler, "I don't think Gordon realizes that he has a tremendous talent. When intelligentsia of the music business courted him, he felt threatened. He's a cautious man who won't take chances." Lightfoot has been honored as Canada's top folksinger often, receiving the prestigious Juno Award sixteen times before being inducted into the country's Hall of Fame. "Gordie is completely original," said singer-songwriter Murray McLauchlan. "He can spin a great yarn--in the gothic sense--and write bittersweet ballads that are very poignant." Despite having traveled all across North America, Britain, Australia, and other places, Lightfoot remains an essentially private man granting few interviews and disliking having his picture taken. His troubadour image is enhanced by his reedy voice and his timeless, thought-provoking lyrics of life and love and sorrow. What Milton Okun observed in his book Something to Sing About remains true: "He seems to offer the sort of restrained self-composure so often seen in highly talented performers. He has no need to shout, because he feels he has something of musical and poetic validity to say." And Gordon Lightfoot has said it well. By January 2002 Lightfoot had written 30 new songs for his next studio album. He recorded guitar and vocal demos of some of these new songs. In September, before the second concert of a two-night stand in Orillia, Lightfoot suffered severe stomach pain and was airlifted to McMaster Medical Centre in Hamilton, Ontario. He underwent surgery for a ruptured abdominal aortic aneurysm, and he remained in serious condition in the Intensive Care Unit (ICU). Lightfoot endured a six-week coma and a tracheotomy, and he underwent four surgical operations.All of his remaining 2002 concert dates were canceled. More than three months after being taken to the McMaster Medical Center, Lightfoot was released in December to continue his recovery at home. In July 2004 he made a surprise comeback performance, his first since falling ill, at Mariposa in Orillia, performing "I'll Tag Along" solo. In August he performed a five-song solo set in Peterborough, Ontario, at a flood relief benefit. In November he made his long-awaited return to the concert stage with two sold-out benefit shows in Hamilton, Ontario. Lightfoot returned to the music business with his new album selling well and an appearance on Canadian Idol, where the six top contestants each performed a song of his, culminating in a group performance – on their own instruments – of his Canadian Railroad Trilogy. In 2005, he made a low-key tour called the Better Late Than Never Tour. 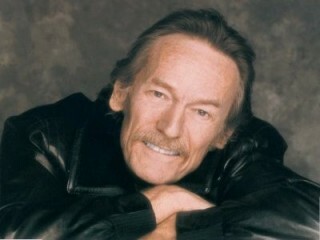 View the full website biography of Gordon Lightfoot.